To represent the Kingdom in the international stage is a tough job. And Miss Cambodia 2017 Rern Nat knows and understands the pressure too well. She will be the second woman to wave the Cambodian flag in the Miss Universe competition in November. With the entire country rooting for her to bring home the crown, how is the 22-year-old beauty preparing for the grand pageant? Youth Today’s Say Tola talks with her. YT: Before being crowned as Miss Cambodia 2017, have you competed in any other competitions? Ms Nat: I did join Freshie Boy and Girl 2013. I was 17 back then. Honestly, it wasn’t my idea to get involved in beauty competitions that time. It was my friend who heard about the auditions and submitted my application. She has a really strong passion for modelling and wanted to take me with her. She said she can see that I have a potential that’s why she kept insisting that I should open myself to such opportunities. YT: Are your parents supportive of the career you’ve taken ever since? Ms Nat: At that time, I was a grade 9th student in Tuol Tom Poung High School. Despite my immaturity and childish acts, my mother encouraged me to do whatever I love. I did not win in Freshie, but I got an award for my behaviour during the competition. That was enough for me. After that, I heard about Miss Cambodia. I already gained self-confidence that time so I submitted an application. I felt that I have the passion for it. You know, I am a fan of beauty competitions around the globe. And to have such prestigious competition here in Cambodia after many, many years, it really feels great. I didn’t want to waste that opportunity. YT: How was your experience in the Miss Cambodia competition? Ms Nat: It was very tough. I had to give up my job as a radio presenter because I needed to focus on the competition. I did lots of exercises to tone my body. I also studied hard to know more about the Cambodian history, culture and tradition. I believe that the pageant is not just about beauty. It’s more of empowering women to become more knowledgeable about her homeland and promote it to the world. I had to go through so much to prove myself that I deserve the crown. And even without professional training, I did win the crown! It was a very big feat for me. YT: Now that you’re wearing the Miss Cambodia crown, how are you preparing for the biggest pageant, Miss Universe? You will be the second woman to represent the Kingdom in the prestigious competition. Ms Nat: I just came back from my 10-day catwalk training in Manila, Philippines. I thank Arise Agency for guiding and sponsoring my trainings. It was an intensive 6pm to 12am training. I was taught not only about walking like a real beauty queen, but also how to communicate well with others. When I came back to Cambodia, I also have daily trainings. Former Miss Universe-Cambodia By Sotheary is helping me as she has first-hand experience on the competition. I also go to the gym to maintain my stamina. Despite all the hard trainings, I can’t help but be very thankful. This opportunity has not just given me something to be proud of. It’s making me a better person. YT: Do you feel the pressure of representing the Cambodian women? Ms Nat: Yes, I do feel the heavy pressure on my shoulder, especially when I was just starting to understand the significance of my beauty title. But Ms Sotheary shared with me priceless pieces of advice. 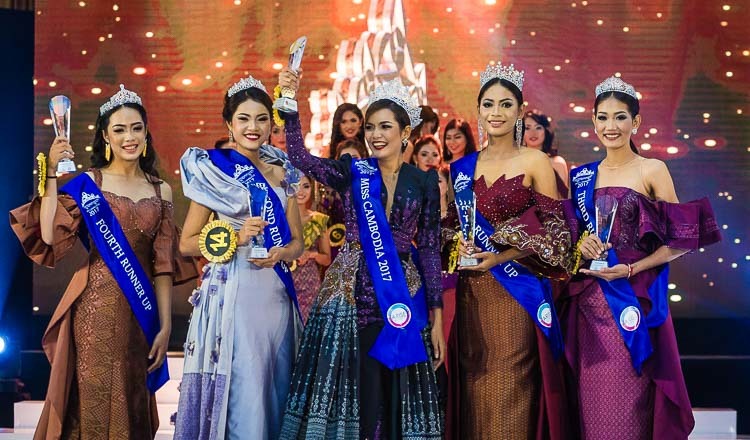 I learned how to deal with the pressure with grace and enjoyed the journey of being Miss Cambodia and representing the Khmer women in the international stage. Every time I feel down, I always tell myself that if other people can do it, I also can. I want to tell the world that Cambodians are strong people. YT: After the pageant in November, what do you plan to puruse? Ms Nat: I already finished high school. I was just not able to attend university after my graduation because of financial problems. I am the only child in the family. I live with my mother and grandmother. My father died before I was born. So, I had to think of my family’s welfare. I found a job at a radio station, which helped me provide for the family. But now that I am earning something from my stint as Miss Cambodia, I also want to invest in my education. After the Miss Universe competition, I am planning to enroll myself in a military school. It’s really my dream to serve the country. I think joining the military will prove that women are as strong as men. I want to push for gender equality as well. YT: As Miss Universe-Cambodia, many Khmers look up to you. What do you want to tell those who want to follow your footsteps? Ms Nat: To all the ladies, don’t be scared to show your potentials. Do not ever think that you can’t do things just because others said so. Or because you don’t believe in yourself. You can do it if you just use your heart and mind. All you need is to take the first step out of your comfort zone. Be whoever you want to be because you have every right to do so. Always and always dream big.